Darkness prevails already at the very beginning of 'La Moustache', Emmanuel Carrère's proper adaptation of his novel of the same title, which he published back in the 1980's. Accompanying the opening credits is Philip Glass' perfectly composed and utterly gloomy Violin Concerto, which re-emerges throughout the movie and constantly supplies the global atmosphere of the film with an ominous and bewildering touch. Welcome to this year's most abstruse film, and eventually the most challenging psychological experiment since 'The Machinist'. 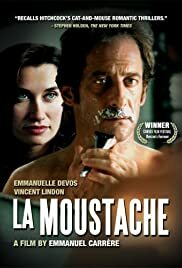 Presented at the 2005 Cannes Film Festival in the 'Quinzaine des Réalisateurs' category - a category promoting abstract and rather unusual movies - 'La Moustache' follows the intricate story of Marc Thiriez (Vincent Lindon), an ordinary Parisian architect who slips into a vicious identity crisis after he spontaneously shaves off his moustache. "How would you react if I shaved off my moustache?" Marc asks his girlfriend Agnès (Emmanuelle Devos) before they visit some friends for dinner. Her reaction is not immediate, and she simply replies "I don't know; I love you with it but I've never known you without it." So while Agnès leaves the apartment for a short time to do some shopping, Marc takes the risk and cuts off his beloved moustache, just like that, in order to see his lover's face and analyze her reaction when she returns home. When you enter the official movie website, a big question mark appears at the end of the flash intro. This question mark is totally appropriate, since it clearly illustrates what kind of movie 'La Moustache' really is: namely a confusing, puzzling drama with an open ending and a number of unexplainable twists, flashbacks and mysterious appearances by characters when you least expect it. "What is 'La Moustache' about?" is the first question of a recent online interview conducted with Emmanuel Carrère. The director himself has no answer to that crucial question. Indeed, 'La Moustache' is one of these attention-grabbing cinematic mysteries that first baffle the spectators, and then leave them behind with a bunch of questions unanswered. There are though, in this ingeniously structured and passionately filmed movie, some easily detectable themes. For once, 'La Moustache' is an analysis of a dysfunctional couple tumbling into a conflict driven by mistrust. Marc soon accuses Agnès of plotting against him, but Agnès is deeply persuaded that Marc has in fact never had a moustache. This marks the beginning of a series of violent arguments and disputes. Moreover, Carrère's film closely focuses on a man struggling with the inevitable loss of his personal identity. Marc is unable to distinguish between reality and imagination, and so he struggles hard to uncover the origins of the problem. He is a man all on his own against the rest of the world. In his apartment, he finds some old pictures from a vacation in Bali, all of them showing him with a moustache. But is he really the only one to see it? Is the moustache on this photo real or not? He does not know, and we do not either. Especially the first part of 'La Moustache' is intensely compelling and dark, examining the relationship between Marc and Agnès, and closely focusing on Marc's progressive battle to keep his emotional and moral nature under control. When his consciousness slowly begins to shut down, the tension mounts as the suspense grows and the atmosphere becomes more and more threatening. Carrère has a brilliant vision, and he captures Marc's way into madness in a diverse and appealing way. Marc is the perfect role for Vincent Lindon, whose look is continually as puzzling as the story itself. He masters his role with ideal perfection, always acting authentically. The same can be said about the brilliant Emmanuelle Devos ('La Femme de Gilles'), who delivers an enigmatic performance as Agnès. Her complex character is a true object of curiosity, and no one can trust her. Is she the evil woman ruining the mind of her partner? Or is she the reasonable person? Question marks à gogo. 68 of 85 people found this review helpful. Was this review helpful to you?